It was a busy night in the second round of the Sussex Senior Cup, which saw holders Eastbourne Borough cruise through with a 9-0 win away at Crawley Down Gatwick. Josh Hare gave Sports the lead before Nathaniel Pinney (2) and Miguel Baptista made it 4-0 at half time. Pinney grabbed three more in the second period while an own goal and Josh Street completed the scoring. Crowborough beat Peacehaven 3-1. 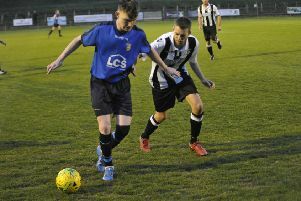 Sam Carrington, Zac Attwood and Henry Muggeridge scored for Crowborough while Josh Marshall scored the Magpies' consolation. Pagham pulled off a great 3-2 win at Ryman South East Grinstead. Scott Murfin and Callum Overton gave the Lions a 2-0 lead before Lloyd Rowlatt was sent off for deliberate handball and Marcus Elliott scored from the spot for the Wasps. Louis Stanton-Cockle then equalised on 68 minutes before Kieron Pamment grabbed the winner. Horsham YMCA score four goals in the last 17 minutes to beat Eastbourne United 4-0. Dave Brown (2) Charlie Cooke and Sam Schaaf got the goals. Lewis Hole and Wes Tate gave Little Common a 2-0 lead at home against AFC Uckfield Town, before the visitors pulled one back on 42 minutes. But Jamie Crone struck seven minutes from time to seal the win for Common. Horsham beat Newhaven 5-2 away. The Hornets rushed into a 4-0 lead after just 24 minutes. Liam McDevitt, a Scott Edwards own goal, George Branford and Tom Lawley gave the Hornets the 4-0 half time lead. Ollie Gill made it 5-0 after the break before the Dockers pulled two back through Ryan Walton and Lee Robinson. Shoreham and Loxwood had to go to extra-time after they were 2-2 after 90 minutes. But Joe Keehan's second of the game on 94 minutes was enough to separate the sides. Chichester City beat Eastbourne Town 3-1. A Scott Jones brace and one from Luke Fenlon gave Chichester the win.